*FOR INFORMATION ABOUT OVERFUNDING SEE STATUS UPDATE. 3) Cuts energy costs by up to 35% for building owners. * For the Dutch version of the pitch, please see the attachment. - Complete platform of compatible services ranging from monitoring to automated building control. - Advanced automated control solution based on Artificial Intelligence techniques. - Hardware-agnostic solution able to connect with most of the current building management systems and IoT devices. - Our revenue model is based on a monthly subscription fee for Software as a Service (highly-scalable model). - Clients pay for hardware and installation costs. - Won the Green Mind Award 2012 - € 100.000 for the implementation of “Sustainable Bernoulliborg” pilot project. - Won the Green Mind Award 2014 - € 100.000 grant for the implementation of “SmartHeating in Nieuwenhuisgebouw” pilot project. - Community Award at the Pioneers Festival 2015, the largest European event for startups, investors and media. 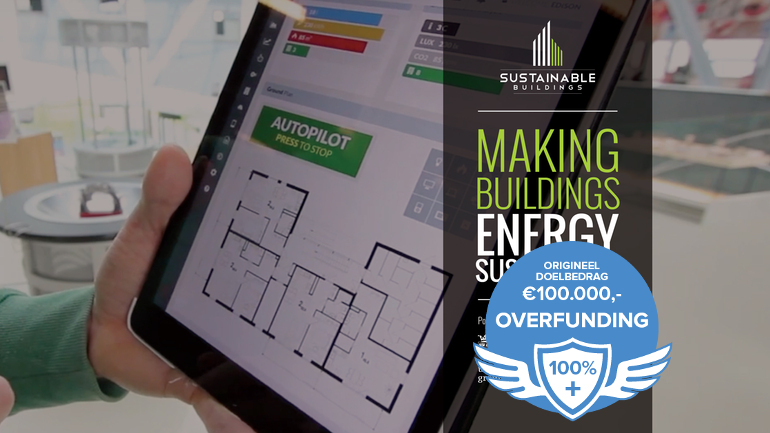 - Won € 10.000 grant for “Sustainable Buildings Challenge” project organized by SURFsara. - Won € 10.000 grant in Startup FastTrack 2015 competition organized by Energy Academy Europe, EnTranCe, Engie, and other parties. The total required investment is € 200.000, of which € 100.000 will be acquired through the Symbid platform (with possibility of overfunding). For the rest, we are currently in contact with investors and Flinc/NOM. The investment will be used to for product development and marketing & sales. Become a shareholder in our company by investing € 20 or more. A) Given the financial projections, we expect that the value of company will at least triple in the next 3 years. That means that in 3 years from the investment, the investors can sell their shares on at least 3 times higher value. B) For the investors who invest €300 or more, besides the shares, we offer our special book “A Smart Energy System for Sustainable Buildings” with a personal dedication signed by our CEO Faris Nizamic. C) For the investors who invests €750 or more, besides the shares and the book, we offer an exclusive entrance to our Crowdfunders & VIP party. D) For the investors who invest €5.000 or more, besides all above mentioned, we offer one free annual subscription to our Consumption Monitoring Service and Energy Scan for a building of their choice. Faris is the CEO, responsible for leading the company and for business development. He strongly believes that bringing advanced IT solutions to built environments will have a great impact on environmental sustainability and on the well-being of us, building users. Faris holds a PhD in Computer Science from the University of Groningen. Previously, he has sucessfully led a 200-member organization. Tuan is the COO, overseeing ongoing operations within the company. He also ensures our product development runs smoothly. Tuan believes that the Internet of Things combined with Artificial Intelligence solutions will significantly change the future of buildings. Tuan holds a PhD in Computer Science from the University of Groningen. His PhD focuses on systems for energy adaptive buildings. Ilche is our CTO in preparation. Ilche will be responsible for technology decisions and for leading our development team in 2017. Currently, Ilche is a postdoc in Computer Science at the University of Groningen. His specialty lies in the fields of Artificial Intelligence and service-oriented computing in relation to automated control solutions for energy saving and office buildings. Will is responsible for designing a highly appealing and responsive front-end of our services. He has broad experience in UI design and front-end implementation, as well as entrepreneurship. Vlad is the main back-end developer responsible for the developments “under the hood”. He focuses on the maintenance and improvement of our software framework as well as the development of APIs that are finally exposed through our front-end. Bas is our specialist for smart heating services. He is currently finalizing his Master's degree in Computer Science on the topic of Smart Heating. Bas is responsible for our pilot projects in the Nieuwenhuisgebouw at the University of Groningen and Coehoornsingel buildings at the Gemeente Groningen. Brian is our technology and software engineering adviser. He is a PhD student at the Distributed Systems research group of the University of Groningen. Brian is one of the main contributors to our software framework and to the solution for smart control of personal computers. Marco is a co-founder of Sustainable Buildings and our main strategy adviser. He is a professor of Computer Science at the University of Groningen where he acquired and managed research projects worth over €3 million. He is involved in several technology transfer initiatives relating to IT and Energy. Andrija is our specialist for the software infrastructure. He has passion for simplifying and automation of software deployment processes. Besides being an intern in our team, he is also working on his AI Master in Human-Machine Communication at the University of Groningen. Lamija has extensive experience in marketing and media. In our company, she will be in charge of communication, marketing and sales. Lamija also has a strong background in video production and that is why she will be in charge for production of promotional video materials. Lamija will join our team in November this year. Sybren is responsible development of software for analysis of building data, uncovering data anomalies, and identifying opportunities to reduce energy consumption or improve working environment. During his BSc studies, Sybren specialized in real-time data collection for healthy offices. Sybren also takes care hardware integration, connecting different hardware platforms to our system. Consumption Monitoring service gives an added value by collecting real-time energy (and water) consumption data, and feeding the energy consumption information back to end-users (public dashboard) and facility managers (management dashboard) in an intuitive and understandable manner. Environment Monitoring service collects data on environmental conditions of a monitored space. For example, monitoring the air quality (CO2 level, humidity), people's presence, light and temperature levels in schools' classrooms. This service gives additional insights into working conditions as well as the ability to improve these conditions, both manually and automatically. Manual Control service is the service that enables facility managers to manually affect the state of the devices in the building(s) they manage. They can control devices remotely from any location using any type of device (laptop, tablet, smart phone). This way, they can prevent problems, resolve complaints faster, quickly improve the working environments as well as save energy. Automated Control service is the most advanced service we offer. It automates energy-saving and comfort-improvement actions. With this service, building owners and facility managers can relax while our service automatically optimizes building operations and saves energy at all times. - Complete platform of compatible services ranging from monitoring to automated control of buildings. - High resolution real-time consumption and environment monitoring (data collection each second, even with 3g module for hard-to-reach locations). - Scalable software solution based on a decade of scientific research. - Modular system (first measure, then optimize). - Hardware-agnostic solution: ability to connect with most of the current building management systems and off-the-shelf IoT devices. - Appealing professionally-designed graphical user interfaces. What's more, our solutions can help getting better energy certificates, as well as help complying to upcoming regulations about energy saving in office buildings (see links: mandatory energy saving, increased energy inspections). - Our revenue model is based on monthly subscription fees for Software as a Service (highly-scalable model). - It enables all buildings to start using our services easily, with a very affordable monthly subscription fee (200 €/building/month for the Consumption Monitoring service). - Our Automated Control includes one-time payment for the automation software package. - Software as a Service model enables high scalability. - Installation of a new instance of our monitoring services (both hardware and software) can be done within 1 hour. - To scale on sales, we first plan to employ more sales force internally, and then speed up the sales process through partnerships and resellers. Consumption Monitoring service: developed and installed in three buildings. Environment Monitoring service: partially developed, prototypes being installed in two schools. Manual Control service: under development, two working prototypes. Automated Control service: under development, two working prototypes. July 2016: The first version of a complete energy management dashboard with basic features will be market-ready and offered to customers. October 2016: The environment monitoring service with basic features will be integrated to the version 1.0 of the management dashboard and made available for customers. December 2016: The smart heating and lighting control solutions will be ready to be used by launching customers. January 2017: Release of the second version of the management dashboard, including both energy consumption and environment monitoring services. Many more advanced features added. June 2017: Beta version of the manual control service, service that controls lighting and heating systems, will be available for launching customers. September 2017: Release of the first version of manual control services. Spring 2018: Release of the first version of manual and automated control services. Regarding the product development, we use SCRUM and Agile software development methodologies to develop and improve continuously both monitoring and control services that are being developed in parallel. The monitoring services for energy consumption and environment will be offered at scale first. The features of the two services will be offered via public and management dashboards accessible to our clients 24/7. In the years of 2016 and 2017, the control solutions for lighting, heating, and other devices will be developed and offered to several buildings as pilot projects with our launching customers and partners. Our plan is to offer our control services at scale in 2018. We focus on the non-residential buildings market as we see large potential for energy savings: 15-35% savings per building. Many non-residential buildings have no management systems, have an inefficient one, or not properly configured one. Moreover, large inefficiencies of these systems come from the fact that building users do not pay for the costs of energy. In the first phase, we focus on university buildings, office buildings, government buildings (including monuments) and hotels. In later phases, we will extend our focus to shopping malls, shops, airports, hospitals and health care facilities. In the meantime, we will consider the possibilities in the residential market as well. According to the BAG register, there are more than 4 million non-residential buildings in the Netherlands. Assuming that owners/managers of non-residential buildings are willing to pay an average of 350 €/month for our provided services, the potential market size for our basic services in the Netherlands is €16 billion on an annual basis. Our goal is to provide the leading energy management system for office buildings in the Netherlands, and then extend it internationally. - QwikSense produces both hardware and software. They focus on increasing productivity instead of energy savings, and do not offer an automated control solution. - Simaxx has a very similar value proposition as our company. However, a proof of the claimed solutions is not available yet. University of Groningen. Our system is installed in 2 buildings of the University of Groningen. In total, the university is using 150 buildings in Groningen. Municipality of Groningen. Our system is installed in 4 buildings of the Municipality, and at the moment we are starting a pilot project where our solution will be installed in the whole building. In total, the Municipality has 250 buildings in Groningen and they have a goal to become energy neutral by 2035. ScienceLinx is our client with whom we developed a so-called Educational Dashboard for their exposition. This real-time energy monitoring dashboard can be used for educational purpose in schools and at the universities. Syncom is our first client for whom we did an extensive energy scan and provided advice for improvement. Syncom has 3 buildings in Groningen. "Working together with SustainableBuildings startup helped our university to become the most sustainable university in the Netherlands." At the moment, we have 70+ leads to follow up on. Some of those leads represent large real estate agencies or hotel owners, owning tens of buildings. To see our 90sec pitch please click here! We are very active with online promotion through social media as well as presentations at events related to sustainability, energy, facility management, and startups. - Science LinX, and more. - still having 70+ leads to follow up. - Presentations on events related to sustainability, energy, facility management, etc. - Participation in business fairs, such as Building Holland, Duurzaam Gebouwd, Duurzame Scholen, etc. - Newsletter to our mailing list. - Sales through partners & resellers. Initially, our goal is to reach out persons responsible for sustainability and energy management, as well as facility managers in universities, municipalities and schools. We plan to do this by series of short promotional video spread across social media channels. Our short videos will promote forward-thinking building owners, facility managers and building users, as well as successful sustainability projects. We will also reach our target group by direct calling and introduction through branch organizations (e.g., VNG - Association of Dutch Municipalities, FMN - Facility Management Netherlands, Facility Management Magazine, etc.). When we start with international growth, we will work on partnering with: IFMA - the International Facility Managers Association, BOMA - Building Owners and Managers Association, and similar associations. - Kieback&Peter is our hardware partner. They provide us with high quality sustainable sensors and actuators that that are harvesting natural resources and require minimum maintenance. Currently, we are talking how to jointly offer our services through K&P channels. - Engie (ex. GDF Suez) is one of the leading energy companies. Together, we work on two pilot projects in elementary schools at the north of the Netherlands. Moreover, we are working on joint proposal for other schools that will be presented on a conference for all Dutch schools this September. Engie has hundreds of buildings to which they supply energy. - Distributed Systems research group is our main knowledge partner. We work closely together on research of new techniques that can be applied in buildings to improve energy efficiency. We acquired € 70.000 for 3 pilot projects and 4 service subscriptions (Gemeente Groningen, Engie, University of Groningen). Our assumptions for the expected revenue are that the sales will start increasing gradually. Specifically, we expect an average of 6 new service subscriptions & 2 service upgrades each month in the rest of 2016. In 2017, we expect an increase in sales, namely an average of 15 new subscriptions & 5 service upgrades per month. This may be considered a rather conservative estimation, taking into account the number of accumulated leads, the possibility of sales through partners and/or resellers, the market interest, and the need for the solution. Moreover, these sales goals should be realistic and achievable taking into account that our sales force will consist of two full-time employees in first two years. The total Required Investment is € 200.000, where € 100.000 will be will be collected through Symbid platform (with possibility of overfunding). For the rest, we are currently in contact with investors and Flinc/NOM. 1) Competition risks - There could be a risk that a competing solution appears that offers a similar service. This may slow down the penetration of our products to the market. We will mitigate this risk by heavily investing in innovation and quality of the products, to provide a leading product in the market. 2) Staff risk - There may be a risk that the growth in staff cannot follow the growth in sales. We will mitigate this risk by actively being part of software development communities, as well as being at the source of talented developers, and, if needed, also acquire specialists from abroad.